Horita, S., M. Kataoka, N. Kitamura, T. Miyakawa, J. Ohtsuka, Y. Maejima, K. Shimomura, K. Nagata; S. Shimizu, M. Tanokura. "Structural basis of different substrate preferences of two old yellow enzymes from yeasts in the asymmetric reduction of enone compounds." Biosci. Biotechnol. Biochem., 83(3), 456-462 (2019). Mohd Fazli, F.A., Y. Shimada, H. Nagano, K. Munesato, M. Takeuchi, M. Takemura, A. Ando, J. Ogawa. "Production of prostaglandin F2α by molecular breeding of an oleaginous fungus Mortierella alpina." Biosci. Biotechnol. 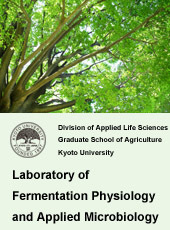 Biochem., 83(4), 774-780 (2019).